Located just East of Allison, IA, Wilder Park is a family-friendly campsite that features 54 campsites and eight tent sites, along with one rental cabin and is open for camping and picnicking year-round. The park offers an array of amenities for guests to enjoy during their stay and include a nine-hole miniature golf course, an 18-hole frisbee disc golf course, a giant chess and checkerboard, pickleball, foot golf, two fishing ponds, a sand volleyball court, and a children’s playground. There are also eight miles of hiking and biking trails, a wildflower prairie, an entertainment stage, and complimentary wireless Internet around the property. 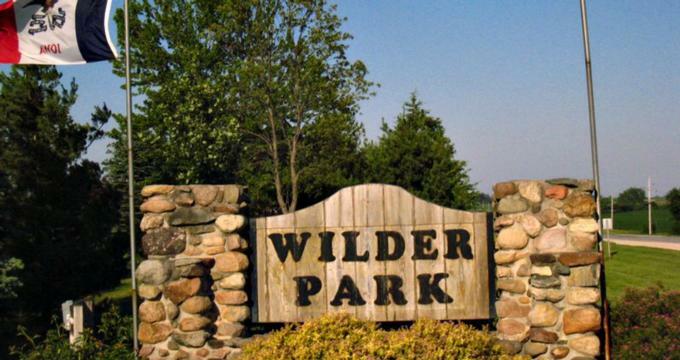 Wilder Park features 54 campsites and eight tent sites, and with one rental cabin. The park offers an array of amenities for guests to enjoy during their stay and include a nine-hole miniature golf course, an 18-hole frisbee disc golf course, a giant chess and checkerboard, pickleball, foot golf, two fishing ponds, a sand volleyball court, and a children’s playground. There are also eight miles of hiking and biking trails, a wildflower prairie, an entertainment stage, and complimentary wireless Internet around the property.